Start delay on any washing machine has considerable significance cost-wise, but you are not locked into having to use this cycle. Many of Whirlpool's washing machines are high-efficiency appliances. 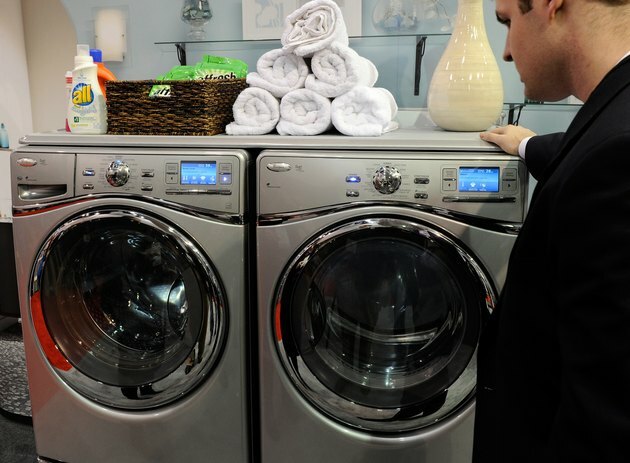 Households rein in utility expenses by using energy-conscious appliances such as Whirlpool's HE washers to delay clothes washing when neighborhood electricity draw is in high demand and prices are higher. Setting the "Delay Start" function involves multiple steps that include picking the cycle and then programming the washer to start a certain number of hours later. However, on many Whirlpool washer models you can cancel this delay in just one step. Whirlpool offers washers and dryers as a high-efficiency "Duet." Whirlpool HE front-loaders have high-tech sensors that detect and control the amount and temperature of the water that is used to clean your clothes. You can delay the operation of most of the washing cycles on the machine for up to 16 hours, only using your high-efficiency front loader during "non-peak" times and further reducing your utility expenses. However, if you need to cancel the start delay to run the Whirlpool washer sooner, then you can simply press the "Power" button once on most models. Whirlpool also labels a fair number of its top-loading washers as high-efficiency appliances, too. What sets HE top-loaders apart from traditional top-loading washers is the way in which the tub or basket agitates the clothes. Instead of using a pulling and twisting action, HE top-loaders flip and spin the clothes through a small stream of water. Again, delaying the wash cycle saves utility expenses, but you can press the "Power" button once on most top-loaders to cancel the current delayed cycle. Most of Whirlpool's traditional washers are top-loaders that do not have advanced push-button control panels and high-efficiency washing functions. Older machines are mostly dependent upon you turning and pushing in a cycle selector knob to start the washer. However, at the time of publication, the company does list the Cabrio Platinum Top Load washer, model WTW8240YW, under the "Traditional Top-Load Washers" section of the product listing Web page. To cancel the start delay for this Cabrio washer model, press the "Start/Pause" button once, which allows you to begin the wash cycle immediately. The term "FanFresh" is trademarked and this feature is a twist on the start delay function in advanced Whirlpool washers. In FanFresh mode, the appliance runs the regular washing phase of your chosen cycle. However, it can prolong the rinsing phase over the course of 16 hours. FanFresh also runs a quasi-drying phase, when a fan blows air over the clothes, almost like line-drying -- inside the washer. You can cancel this cycle on most washer models by pressing the "Power/Cancel" button once.